I was scheduled to audition this afternoon for the TV show “Blue Bloods” which would have been totally cool because it would mean I was finally breaking into the TV casting world. Last night after midnight my agent messaged me the audition was canceled. Admittedly I should be disappointed. But the truth is I am secretly relieved to finally have a day off. No auditions, no rehearsals, no filming, no wardrobe calls. And the cat and I have the penthouse to ourselves to party, listen to music, and (ahem) edit GOLIAD UPRISING. The last two months have been a dream come true. It’s really been amazing. 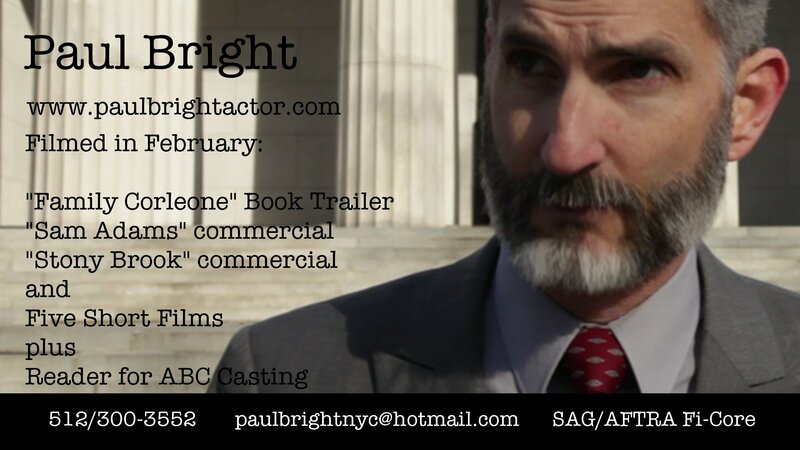 Three commercials, a pilot, a whole bunch of short films (some of them not-so short), a gig as the audition reader at ABC TV (which was completely awesome), and a steady stream of auditions and rehearsals. I’m getting calls to work short films without auditioning for them, and casting directors are calling me in directly to audition for even better paying gigs. The best part of all this is that the projects have been really interesting and a lot of fun. I didn’t feel that way about it when I was a teenager doing commercials in LA. I used to dread auditions, and even more so dreaded a day spent on set. Now I find I love it. Yesterday’s shoot was a promo for the new novel “The Family Corleone” written by the son of Mario Puzo as the prequel to “The Godfather.” Adam Reid was the director and he was a blast! His first feature film is nominated for an Independent Spirit Award this coming Saturday night, by the way. I think it’s so much better for me now than it used to be because I’m finally settling in to being myself, no longer worried about impressing anyone or hiding anything. I am what you see, and you either want it or you don’t. Thus the auditions are a breeze and really fun. Last night when I auditioned for a sci-fi film I was tired after filming the commercial and my brain wasn’t really working. At the end of the audition the director walks me to the elevator telling me he’d auditioned all these other actors and none of them came close to capturing the character the way I did. I didn’t do ANYTHING for this audition. I was just me. At this point I’m scheduled to do three films in March. Now this does not make a career, and I know this. In order to sustain this life I will have to be accepted into the TV show world, get more agents, build relationships with more casting directors, and (ahem) edit GOLIAD UPRISING. However there are enough successes to make me believe it will continue to get better. Imagine for a moment that you were my New York boy-toy and you’ve got this guy moving in with you saying he’s gonna make it as a New York actor, and all you’d ever seen of his work was a murder mystery performance at Spaghetti Warehouse. His friends were dubious, to say the least. He’s been supportive all the way through and now he has proof to show his friends he wasn’t being hoodwinked. Bright Filmmaking isn’t making much headway at the moment. I put all this information out there, yet few people are finding it. That’s a bit of a bummer. When I finish the release of ABRUPT DECISION and then the release of GOLIAD UPRISING and before I start filming *the next movie in August* I’ll be able to concentrate on helping other filmmakers with their projects. So now the only thing on today’s agenda is editing: Firing up the hard drives again and piecing together the excellent work of Shannon Lark, Aaron Weisinger and Dusty Cross. 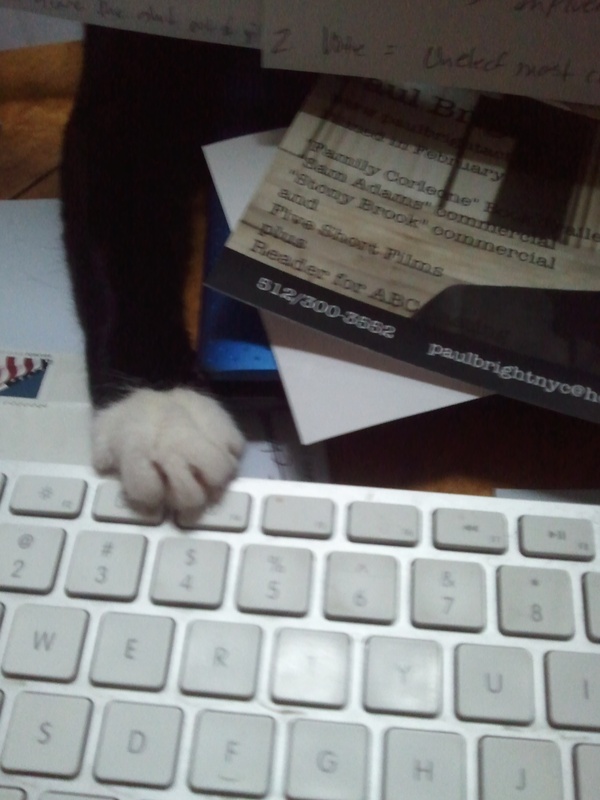 If I can keep the cat away from the keyboard long enough, that is. If not, film editing credit may go to Constance Ambiguity Tailswisher.